Our office carpets get put through the ringer. All day long people are in and out, walking all over the carpets. Things get spilled, and some times they get cleaned right up, while other times they get ground into the carpet. Spores and pollen get imbedded in the carpet and moisture gets deposited creating a perfect place for mold and fungi to thrive. Well, to be honest, it depends on where you are. In the south east, this is the end of rainy season. In the west, rainy season is about to start. But no matter where you are, there is a rainy season. And with rainy season comes people tracking their wet feet on your carpet. This grinds the water deep into your carpet where it takes a while to evaporate. This moist dark depths of your carpet becomes a prime breeding ground for mold, and mold creates respiratory problems for your staff reducing productivity and increasing sick days. 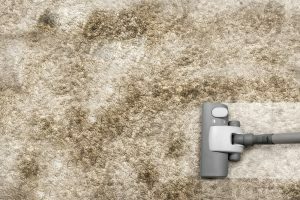 The reduction of mold is one of the most important reasons you bring in professional carpet cleaners to routinely clean your office carpets. However, it is not the only reason. Yes, mold and other allergens can get caught up in your carpets fibers and cause lower productivity and increase sick days. But there are many other reasons to get your carpet cleaned. All the debris that gets tracked through your office and ground into your carpets can emit odors. Organic materials like leaves or food can start to decay when moisture is added to mix. This creates unpleasant smells in your office. These smells can have a negative impact on your staff and your clients. Sometimes these smells can be subtle and you can get used to them, but they are still there, affecting you on a subconscious level. Have you ever noticed that when you go on vacation and are away from your office for a week or more, you can notice the distinct smell of your office when you first return? After a while, you “get used to it”, but that just means your conscious mind has pushed it out of the way. Everyone who first walks into your office smells it. And subconsciously, you do as well. Flooring is one of the more expensive parts of your office. If you needed to replace the flooring in your office, not only would you need to shell out the high cost of new flooring, but you would need to suspend operations or move operations until the job is complete. Then you would need to spend the time to move everything in your office someplace where you are not replacing the floors. Properly cleaning and maintaining your floors help you avoid the massive cost of replacing them. At Summit Janitorial we are trained to take care of your carpets. Our team will take extra care to make sure your carpets are clean and fresh smelling. They will be mold free, and last far longer if you allow us to take care of them. Breathe easier when Summit Janitorial takes care of your office carpets.